Gold Biotechnology gravity flow, Empty Spin Columns are an excellent option for small quantity protein purification processes. Customers may buy bulk resins and then pack their own his tag purification columns as an economic option. The Spin Column serves as a tool for purification using small quantities of resin (50 – 100 µl). It is a single-use format for purifications with syringe (luer lock system) or by centrifugation. 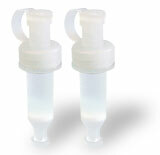 Each package contains 25 Empty Spin Columns supplied with end caps & two top caps (luer lock & rubber gasket screw cap). The Plastic Spin Columns are polypropylene and contain a polyethylene frit with a nominal pore size of 35µm.